Why, hello there! I'm still here, though life is certainly different. 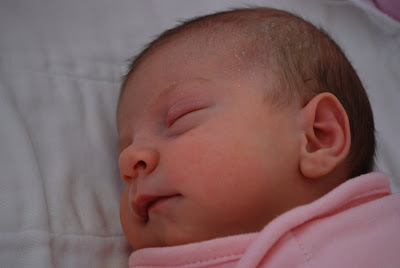 Amazingly, my little peanut is four weeks old today. She's already put on a fair amount of weight and grown an inch in length, no doubt in large part due to the amount she's been eating (we're talking 8-10 feedings a day). Taking care of her doesn't allow me much free time, especially when she's fussy between feedings, but I have managed to work some fibery pursuits back into my life here and there. I discovered very early on that I was really missing my wheel, especially because my January shipment from the Crown Mountain Farms fiber club arrived early. 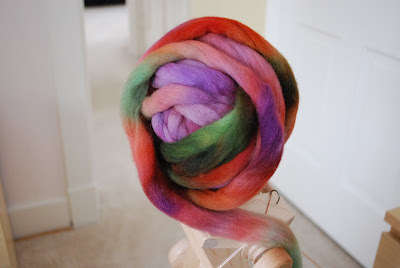 This is Falkland wool in a colorway called Awakenings. 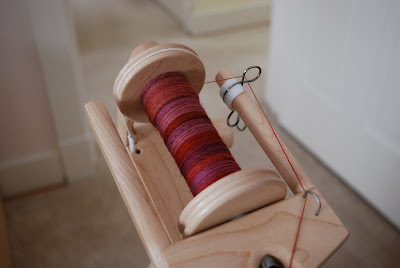 I've already started spinning it up relatively thin with the plan to chain ply it to preserve the color repeats. This bump is only four ounces, but considering that I'm only managing to spin a few minutes at a time, this yarn is going to take a while to complete. I'm really happy with how this turned out. 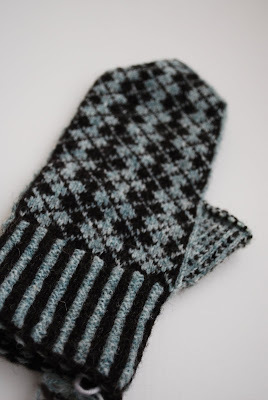 The thumb shouldn't take very long to complete (especially as the colorwork isn't as complicated), but I have a feeling the mate won't be finished until long after winter. 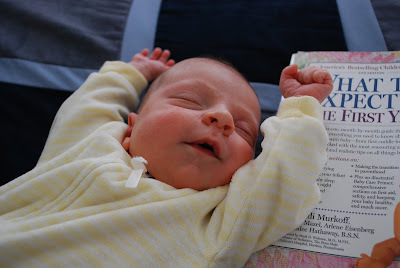 Because I'm a bit light on knitting and spinning content, will you settle for some gratuitous baby pictures? 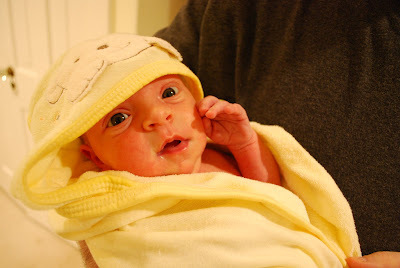 Here's Rainbow after last night's bath, only the second time she made it through the ordeal without screaming. and then on the bed next to me right before a feeding. This is how she'll sleep if we don't swaddle her arms at her sides. Cracks me up. And now I must run, because it sounds like someone just dirtied her diaper. Oh, the joys of motherhood!